For the French, Christmas without shellfish is unthinkable. 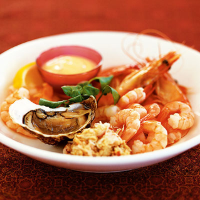 Adjust the mix of shellfish to suit your taste and the numbers you are catering for. Preheat the oven to 180°C, gas mark 4. Place the garlic on a baking tray and drizzle with 1 tbsp of the oil. Sprinkle with a little sea salt. Place in the oven and roast for 30-35 minutes until the cloves are soft. Squeeze the flesh from the roasted garlic into a blender or food processor, then add the egg and lemon juice and blend until well combined. With the motor running, pour in the remaining oil in a thin, steady stream until the mixture is thick and creamy. Adjust the seasoning to taste. Transfer to a bowl, cover and place in the fridge until required (for up to 24 hours). Assemble the platter by placing the seafood on a large serving dish. Garnish with lemon wedges and lamb's lettuce and serve with a wholemeal bread such as Waitrose Organic Old Fashioned Wholemeal Batch Bread. You can use Waitrose Lemon Mayonnaise as a simple alternative to the aïoli. Take your pick from the choice of seafood at our Fish Service Counter. A ripe but fresh and slightly oaky Chardonnay is a treat with seafood. Try Terrazas Alto Chardonnay 2002 Mendoza, Argentina.